For photographers looking to make prints from negatives in the darkroom, an Enlarger is an essential tool. Essentially, they are rather like a slide projector aimed downwards at a base board where the paper is placed. Enlargers come in a variety of different sizes depending on which negative format they are capable of enlarging from. Customers who would like any assistance, please contact us and we will be pleased to discuss any aspect of enlarging and printing. The Kaiser range offers a superb selection of modular enlargers and is the most extensive and best served range on the market today. Made in Germany, the range also has excellent back up from Kaiser. 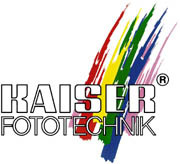 We have a fully functioning darkroom in Birmingham where we can demonstrate Kaiser enlargers - please contact us any time and we will be pleased to arrange a no obligation demonstration.